Entrance Hall - access hatch to loft, built-in cupboard, radiator. Lounge - 4.78m x 4.00m (15'8" x 13'1") - (max) gas fire in tiled fire grate, radiator, bay window to front. Kitchen/Dining - 3.86m x 3.55m (12'8" x 11'8") - (max) fitted base and wall units with worktop surfaces, inset sink, tiled splashbacks, plumbing for washing machine, airing cupboard with hot water cylinder, built-in pantry, built-in store housing gas central heating boiler, radiator, door to Conservatory. Conservatory - 3.87m x 3.65m (12'8" x 12'0") - (max) UPVC double glazed and brick, electric wall heater, double doors to rear garden. Bedroom (1) - 3.84m x 3.23m (12'7" x 10'7") - radiator, window to front. Bedroom (2) - 3.21m x 2.85m (10'6" x 9'4") - radiator, door and sidelights to rear garden. Bathroom - 2.17m x 1.72m (7'1" x 5'8") - panelled bath, pedestal washbasin, WC low suite, tiled splashbacks, electric wall heater, radiator, heated towel rail. Outside - Shared driveway to parking space. Enclosed front lawn and flower borders with pathway leading to spacious rear garden comprising paved patio area, lawn, flower beds and borders leading to lower level lawn and garden. Detached Garage - 7.00m x 2.82m (23'0" x 9'3") - (external). Directions - From the town centre proceed over Longbridge turning right at the roundabout onto Commercial Street. Continue along this road and turn left before the Cambrian Bridge onto Lower Canal Road. 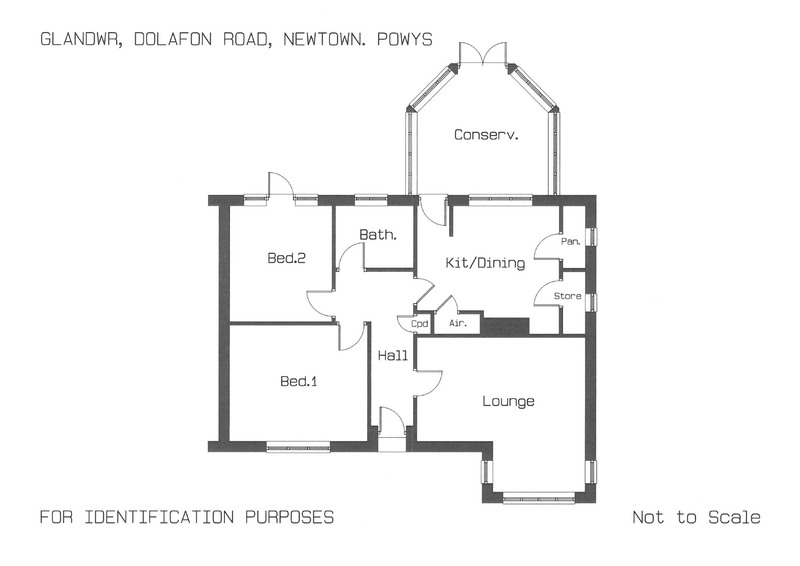 Proceed along this road and turn right by the Waggon & Horses Public House onto Dolafon Road, continue for a short distance and after a sharp right hand bend, Glandwr is the third bungalow along on the right hand side indicated by the Agents For Sale Board.